The other day, I once again, viewed a story on one of the morning news channels as to how, we Americans, forfeit a good percentage of the vacation time given us by our employers. There is also a growing population of the self-employed, who simply cannot carve out the proper amount of time if they want their businesses to succeed. There are, of course, families which have multiple people in the household with different schedules. For most New Yorkers, this is a common dilemma. Though we, at Dish Our Town, endeavor to always try to inspire the aspirational vacationer to pack up and see the world, we appreciate the fact that this isn’t always feasible. We, ourselves, have fallen into the category of not being able to leave town more and more often these days. For the sake of sanity and to satisfy a restless spirit, we look to share with you an option that we feel is somewhat overlooked – a “Staycation”. This can apply to many major cities around the world, but for all intents and purposes, I can only write about my hometown, New York City. The beauty of a city like mine is that it has so many new things to offer, even for long time residents as myself, as its landscape is forever expanding and changing. It’s also common for we New Yorkers to not find time to visit the quintessential sites ourselves (which, in itself, is a bit of a tragedy) and leave them for the tourist. Recently, during one of our daughter’s breaks from school, we couldn’t get away. So, instead of feeling sorry ourselves, we decided on experiencing our town as tourists. We reside in downtown New York City and have worked most of our lives uptown. Our daughter goes to school uptown as well. As a local, we had to find that void that needed filling; and the answer came quite quickly. A part of town we try to avoid (mostly due to traffic) is Midtown Manhattan. I think many New Yorkers do as we, and also dodge this area of town whenever possible. With that said, we knew we were missing out on things happening in those neighborhoods and needed to give Midtown a chance. 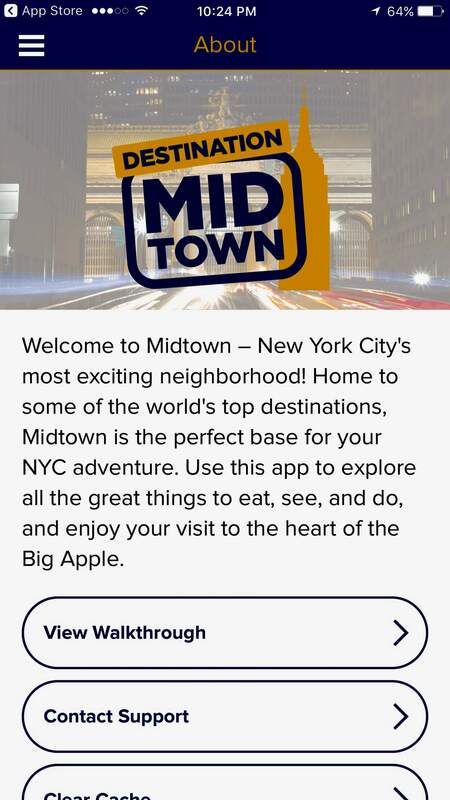 To make sure we were making the right decision, I, along with my wife, downloaded a new app onto our smartphone devices called, “Destination Midtown”. 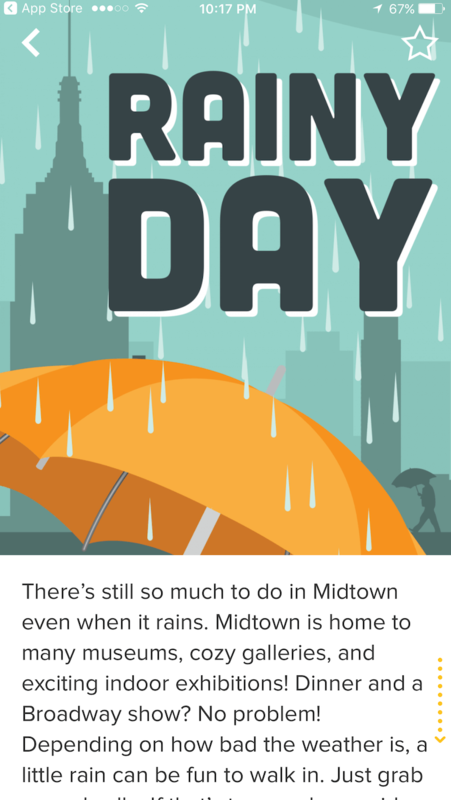 The app extrapolates endless information about Midtown and divides them into unique classifications for a more tailored experience. Choices can range as broad as a block by block walking tour of Midtown, listing the “must see” destination such as Radio City Music Hall and Rockefeller Center to something a bit more refined such as what to do on “Rainy Days”. 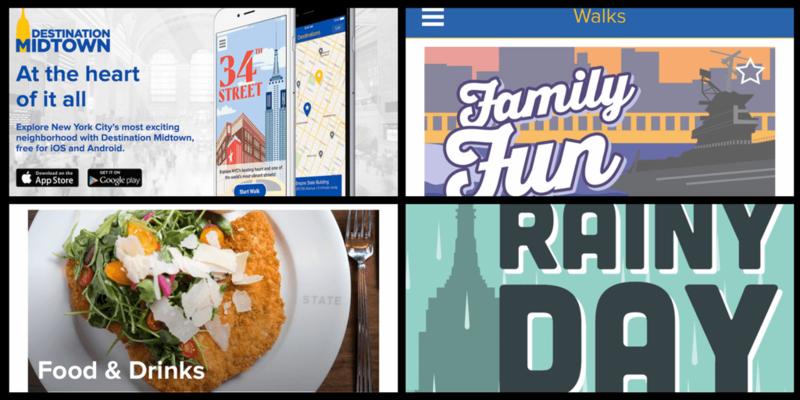 It is an easy app to navigate, even for someone like me who isn’t the most tech-savvy. Within the app, there is a map with markers of destinations as an overview. The map focuses in on the area between 23rd Street to 51st Street and goes as far East as 3rd Avenue and West to 12th Avenue. There is an “Interest” category which is very helpful, especially when looking for unique place to eat near the destination you would be currently. There is a category for “events” that are taking place in the city, and as mentioned earlier, suggested “walks”. Within every category, there are subcategories, such as “insider tips” where one can find those little facts that may not be known by the common visitor, such as when free admission is available for certain sites that may otherwise have an entrance fee, along with what is considered to be the best places to take a “selfie”. When planning for a trip or just the day, there is a “Midtown Info” section, which is a great place to start, where listed are places to stay, top restaurants in which to dine, transportation options, etc. Destination Midtown is made of a cooperative of businesses in the area that works together to help create the best experiences possible, so when it comes to eating and staying, there is a range of price points in which to choose. 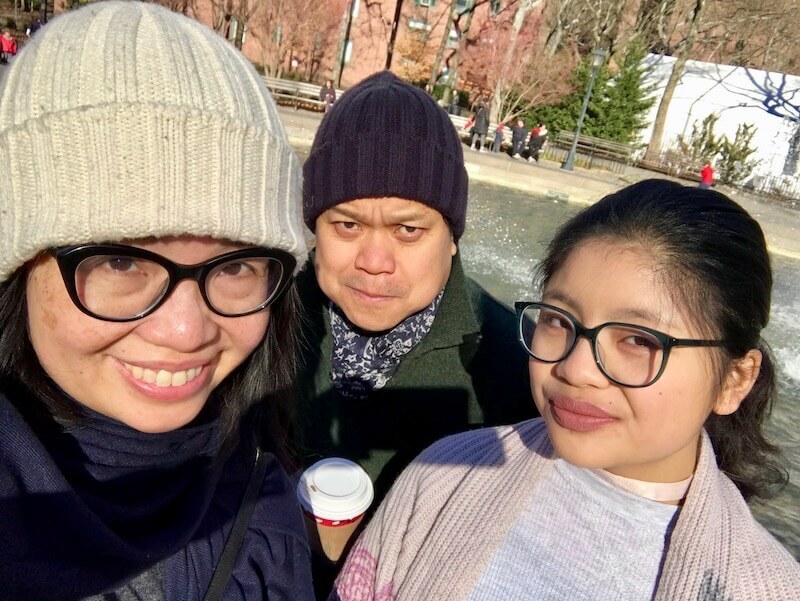 During our “staycation,” we chose to take the walk entitled “Night Out”. Not until we looked into this app did we realized that the iconic Empire State Building is open until 2 AM! These late hours gives the opportunity to experience the marvelous structure and the view it purveys in what feels like a more intimate setting. This is perfect for a family like ours, who has a teenage daughter who likes to stay up late, but too young for typical late night venues. I have been to the Empire State Building many times in the past, but have not in many years, and with the upgrades made in recent years, The Empire State Experience felt very fresh. So, if you haven’t been in a while, it’s worth coming back. A nice way to start the evening is to have dinner at the State Grill and Bar located within. The decor in the restaurant is seamlessly integrated with the original, magnificent, Art Deco design of the structure itself. The food, like the building, is top notch. In some ways, one feels transported back to a previous era in this great town. Another walk we decided to do was entitled, “Family Fun”, which mapped out our day starting on 26th street and had us finish 20 blocks later. There were spots we have never visited and felt fortunate in having done so. One of these is the Morgan Library and Museum. This private library of financier Pierpont Morgan harkens upon New York’s old world glory. It is a magnificent collection and structure to behold. This, like many, was new to us and may have never seen if it weren’t for the guidance of the app. Experiences such as this and the one in the Empire State building that really made us feel like we were tourists. Moreover, away. A staycation can further be enhanced by staying in a hotel versus doing it from home. This added element of packing, being checked in, unpacking and using the amenities in the hotel, makes anyone feel as if they were truly on vacation. For a family of three, like ourselves, with a teenager, it is often hard to find a single room large enough to accommodate us. Usually, the only option is to get an adjoining room or a suite. Luckily, the Langham Place, a premier hotel located right on Fifth Avenue, has rooms that cater specifically for such a need called, The Family Room. Another addition to the already beautiful hotel is the in-house restaurant Ai Fiori. A special option without leaving the premises for food lovers like ourselves. It may have been only a couple of days, but when we returned to our apartment, we felt refreshed, as we would have if we took a formal vacation. So, if you can’t find the time, try to don the hat of a tourist in your own town, you’ll find it more than satisfying. If New York happens to be your town, take our word, it’s a ton of fun, and consider Midtown to be your destination. Some links are affiliate links, but as always, prices remain the same for you. This is great, will come in handy while visiting NYC! So glad you are finding it helpful, it’s going to be an exciting trip! Thanks for reading, Vikas. Hope you take some time to visit Alphabet City, while in NYC. I LOVED New York! I was seriously so surprised by how much I loved it. I thought it would be like any other city and it was so different from other cities! Yes, New York stands alone. There are many great cities in the world, but NYC is the tops. Thanks for giving us a read. Your article reminded me of my trip to NYC last summer. I was up on the Empire State Building at midnight. We did some of the touristy things, but we also saw four Broadway shows in three days! I’ll never forget that trip! Glad you enjoyed our city. Come back soon, lots of new shoes on Broadway to see. 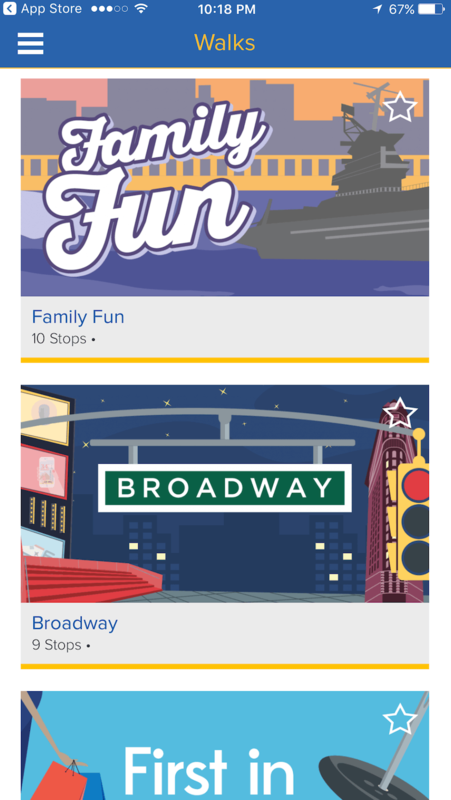 Yes, great city and fun app. I don’t always promote these things, but this I really like. Thanks for reading. This looks like a helpful app for exploring midtown NYC! NYC can be overwhelming with so many places and things to see, but this app provides an easy way to plan a trip. 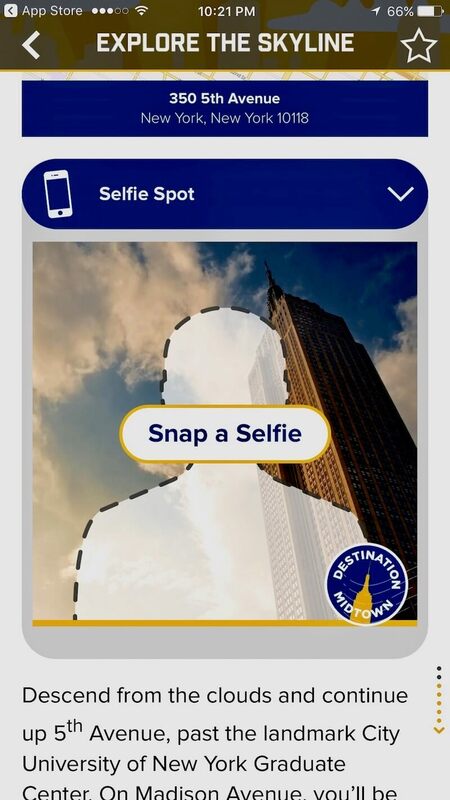 I especially love its feature on selfie spots! Cat: Thanks for giving it a read. Yes, great app. I don’t usually promote these kind of things, but I really like this one. Hope you get to use it some day soon. I’m from the US but I’ve never spent time in New York! I definitely have to go. I’ll be sure to check out this app when I plan my trip. It sounds awesome! Yes, please visit Richelle; and download the app. Extremely helpful. Thanks for the read. Yes, visit soon and download this app. You’ll have fun with it and make the trip more enjoyable. Thanks for reading. Chloe: Thanks for giving us a read. Yes, a good app; definitely one of the better ones out there. Hope you get to use it some day soon when you visit.